The port at Sakaiminato is located approximately 5km from the city center. A 10 minute taxi ride. There are three berths: Showa South Berth (most likely), Gaiko Berth and Takenouchi Berth. Wedged between sea, sky and mountains, this small fishing port has been esteemed for centuries for its superb seafood. Sakaiminato is the home of Shigeru Mizuki, the creator of GeGeGe no Kitaro, a character seen in many forms throughout Japan. The spirit of Kitaro can be found in Sakaiminato, on Kitaro Road, a street dedicated to all the characters that appear in Mizuki's stories. One hundred bronze statues of the story's characters line both sides of the road. Hama Loop Bus has Two Courses; Main Course and Life Course. Main Course conveniently runs around a network of major places such as Municipal Administration Offices, Hospitals and Sight-seeing Spots. There are a Bus running Right Loop Course and a Bus running Left Loop Course. One Loop Bus runs right loop clockwise and the other one runs left loop counter clockwise, each departing from and arriving at the City Hall which is the base point. It would be more convenient if one would check the location of bus stop where to get on and where to get off before using the loop bus. 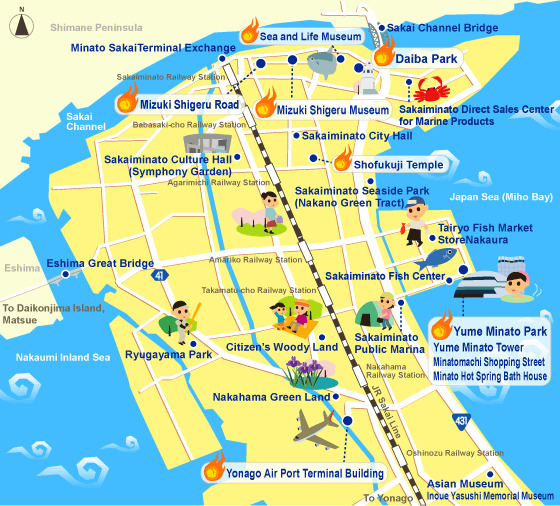 The fishing wharf and center of town are compact enough to enjoy on foot. Sakaiminato is also your gateway to a very ancient region of Honshu. West of the city lies Izumo-taisha, one of the oldest and holiest shrines in Shinto. This area is dotted with burial mounds from Japan's Bronze Age. The town of Matsue boasts the celebrated "Black Castle," a six-story, black-walled castle that home to a clan of the mighty Tokugawa dynasty that ruled Japan for over 250 years. And to the east rises the great snow-capped summit of Mt. Daisen, considered one of the four most scenic mountains in all Japan. Kitaro-related souvenirs of all types are available everywhere. Anything related to the Medama Oyaji or Eyeball Daddy character seems especially popular.